Your bbq enthusiast friend has just moved into his/her beautiful new home with the large patio. 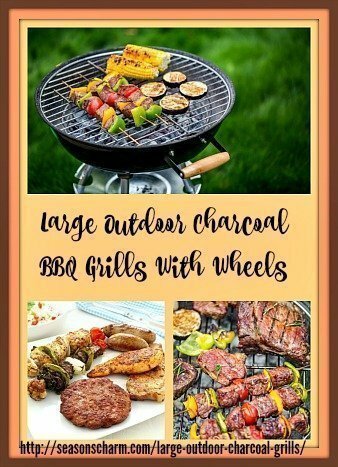 The perfect housewarming gift for someone who likes to grill and entertain would be one of those large outdoor charcoal barbecue grills. Large charcoal bbq grills are great for those who cook for large groups of 20 – 30 guests or who have to (or love to) grill large cuts of meat such as large racks of ribs or a big chunk of beef. Outdoor grilling is all about having fun and forming beautiful memories. Friends and loved ones hovering around the grill talking and laughing can be such a lovely experience. You can’t go wrong with the classic Weber outdoor charcoal kettle grill. The Weber kettle grill has stood the test of times. Weber kettle grills come in a few sizes, ranging from the small 18.5″ one touch charcoal grill to the extra large 26.5″ grill. The original best selling 22″ Weber charcoal grill kettle has a 363 square inches of grilling surface which translates to about 12 – 15 burgers. The large 26″ Weber 16401001 Original Kettle Premium Charcoal Kettle Grill has a grilling surface of 508 square inch. The Weber 15502001 Performer Deluxe Charcoal Grill, 22-Inch, Copper is the deluxe version of the classic kettle grill. The cooking area is still 363 square inch but this model comes with an electronic Touch-N-Go gas ignition system to start your charcoal burning. The grill is fitted into a sturdy painted metal work table and has a wire bottom rack for putting your bag of charcoal. A fancy removable rust resistant aluminum ash catcher adds to its awesome features. Just detached it from the grill when you have to throw away the ash. The ash catcher for the 26″ and 22″ are different in design. The bowl handles come with a handy integrated tool hook for hanging your grilling tools, making them conveniently within reach. There is a hook on the inside of the lid which you can use to hang on the side of the kettle body. You do not have to put the lid on the ground. 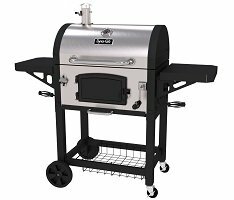 The large DGN486SNC-D Heavy Duty Stainless Charcoal Grill model comes with 3 heavy-duty, hi-gloss porcelain enameled, cast-iron cooking grates, 1 charcoal basket adjustment tray and 686 square inch of total cooking space (about 24 hamburgers). The extra large DGN576DNC-D Premium Charcoal Grill comes with 3-cast iron heavy duty sliding porcelain enameled cooking grates, 1 charcoal basket adjustment tray and 816 square inch of total cooking area (about 30 hamburgers). The extra large DGN576SNC-D Dual Zone Premium Charcoal Grill comes with 4 cast iron porcelain enameled heavy duty cooking grates, 2 charcoal basket adjustment trays and 816 square inch of total cooking area (about 30 hamburgers). You can control the temperature and air flow of the Dyna-Glo outdoor charcoal grill by using the charcoal tray adjustment crank and the stainless steel smoke stack with adjustable flue as well as the sliding side dampers. The charcoal tray adjustment crank can be used to adjust the distance between the food and the hot charcoals. Opening the air vents at the side with the help of the sliding dampers will increase air flow and raising the temperature. The cooking temperature should not exceed 500°F ( 260°C ). Using heat resistant gloves is recommended when dealing with hot surfaces. According to manufacturer’s manual, estimated assembly time is 50 minutes with 2 people. 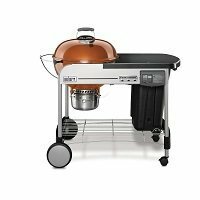 Char-Griller outdoor charcoal grills with wheels range in sizes from 580, 635 or 1065 square inch total cooking area. Comes with 1 wooden side shelf for putting your grilling accessories such as plates. Hooks are attached onto shelf for hanging your grilling tools. Large outdoor charcoal barbecue grills bring back fond memories of happy occasions and celebrations.